I caught an interview on CNBC's Squawk Box this morning with Tom Gallagher, Florida's Chief Financial Officer. The interview was supposed to be about the remaining cleanup from Hurricane Katrina's fly-by one year ago but Becky Quick moved on to the state of Florida's housing market. The otherwise candid Mr. Gallagher mentioned that building had slowed but that prices were still increasing, although at only 1% annually. Folks, that is what's known as spin. Although accurate in one sense, it does not represent the whole truth. What Mr. Gallagher was referring to was the median price, which in the most recently reported period had increased by 1%. The median is that magical halfway point in the graph where half of all sales are above and half below. This number is in no way related to the appreciation rate of individual properties. As the media is reporting more and more on the housing slowdown, I'm seeing all kinds of commentary about the direction and extent of the event. The camps seem to be divided between the end-of-the-world predictions of the housing bubble bloggers and the outright denial of the National Association of Realtors. The former is fond of the term "crash" and the latter, the phrase "soft landing". As with most polarizing issues, the truth probably lies somewhere in the middle. Sellers who are unwilling to accept the reality of lower prices may not sell their properties and buyers who are waiting for the bottom may still be waiting after the bottom has passed. No one is going to wave a red flag and say, "This is it. The bottom is now." I have already seen deals go down that are going to be hard to beat even if the downtrend continues for a while. Some sellers have completely capitulated and are dumping properties at bargain prices. My advice to sellers is to be bold and price aggressively if you must sell. You have lots of competition. My advice to buyers is get ready. The time to start looking is now. Be ready to pounce on that perfect property at a discount when it hits. If you're looking for a like-brand new 3/2, 1500 sq.ft. condo in a riverfront complex for $220,000, you've already missed a good one. 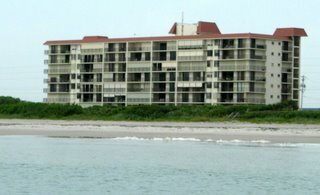 How about a 1350 sq.ft., 2/2, 6th floor, direct ocean condo for $299,900? Sold last month. Photo below of this building. Brand new 1/1.5, 908 sq.ft. 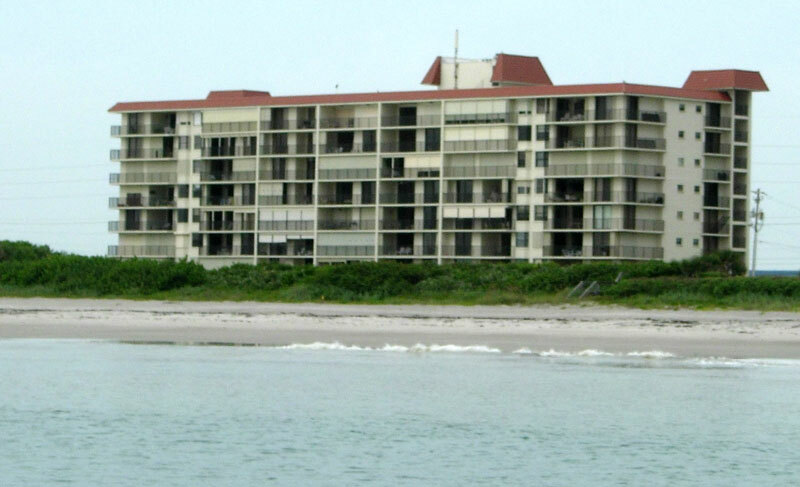 condo with cathedral ceilings, short walk to the beach for $137,000. Again, sold last month. One more recent sale; a 1279 sq.ft. 2/2.5 townhouse with boat slip, 3 blocks from the beach for $205,000. There are others out there and more to come as the sellers come to terms with their competition and the reality of the market. Freddie Mac reports that 30 year mortgage rates are at their lowest point since April 6 of this year. National average for a 30 year fixed is 6.48%, down for the 5th week in a row. Until next time, make sure your cast nets are in order and your snook fishing gear is ready. The mullet run is imminent and the big tarpon are already active off the beach. I can't wait.